Considering the real dearth of Thanksgiving-themed music (unless you count this, er, masterpiece), it's hard to know what to play during those seven hours you spend in the kitchen on Turkey Day. Spotify is here to make the call for you with a nifty new interactive feature that picks optimal tunes, based on the size of your bird and your musical tastes. 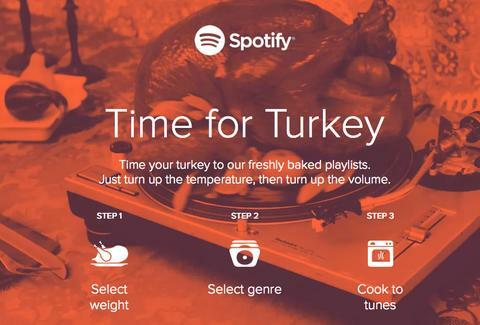 "Time for Turkey" first asks you for the weight of your turkey so Spotify can set an appropriate length. The sliding scale lets you go from 4 to 24lbs, with an option for stuffed or unstuffed to make the estimate even more scientific. Then, you choose from six appropriate themes: Americana, Family Time, Feeling Thankful (which suspiciously features an image of the Mamma Mia! movie soundtrack), Club Kitchen, Freshly Baked, and Golden Oldies. After you've made your selection, Spotify generates a playlist that will power you through the entire cook time. It's all based off the USDA's own roasting timetable, so your bird should be done once the music is, though Spotify reminds you to check frequently just to be safe. Also, while you're technically supposed to shut this thing off once your food is ready to serve, nothing's stopping you from keeping it going to drown out Uncle Larry's views on Syria. Kristin Hunt is a Food/Drink staff writer for Thrillist, and would probably just pick an endless loop of Paul Simon singing "Still Crazy After All These Years" while dressed as a turkey. Follow her to SNL throwbacks at @kristin_hunt.